Sara Granda, the woman paralyzed from the neck down who was able to take the state bar examination only after the governor and the State Supreme Court intervened, passed the bar today. "Sara has overcome so much in her life and today I congratulate her for once again persevering and passing the California Bar Exam," Gov. Arnold Schwarzenegger said in a prepared statement. "Her hard work, dedication and outlook on life" are an inspiration and prove that "opportunity lies in every obstacle," he said. "She is a fighter and today I join Sara, her family and friends and all Californians as we celebrate her tremendous achievement," he said. Granda, 29, can breathe only with a respirator, the result of a car crash when she was 17. 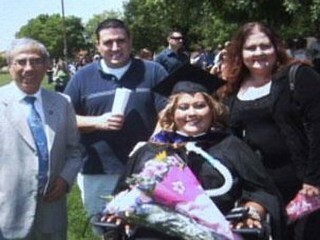 Since the accident, she has earned three college degrees, including one in May from the UC Davis School of Law. Confusion over her registration fee led to the State Bar of California's determination that she was ineligible for the exam because it had no application when the June 15 deadline passed. Schwarzenegger, wrote a letter to the members of the Supreme Court, urging them to grant Granda's petition to be allowed to take the exam. In a 6-0 ruling on July 27, the high court granted Granda's petition for what is called a "writ of mandate," directing the State Bar to let her take the exam. A New Member of the SCI Family?